With football season back in full swing (er, punt? ), I had a reader request to style a look for game day that's stylish and out-of-the-box. If you know me, you likely know I'm not much of a sporty gal. I can't say I'm ready to run out to play flag football, but the spirit of being in Kansas City has made attending Royals, KC Sporting, and Chiefs games a really fun experience for me and my husband. 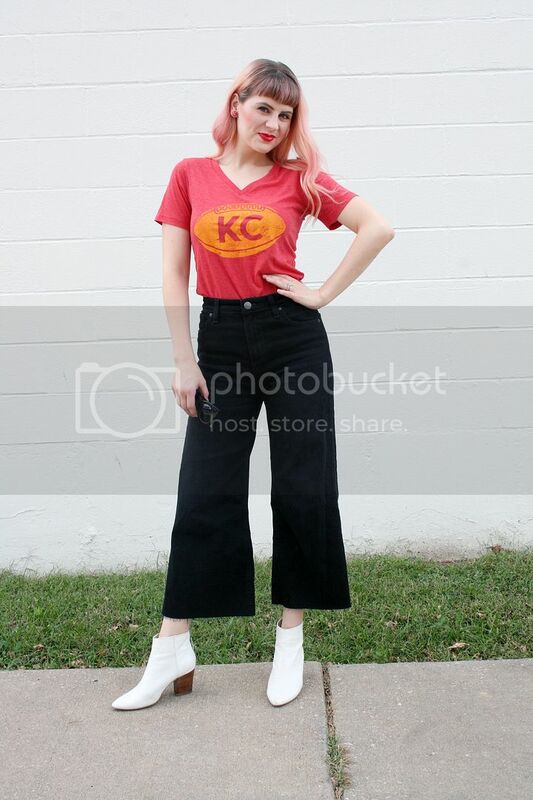 Though you can grab a Chiefs t-shirt and pair it with jeans any day, I love the idea of taking a game day outfit to the next fashionable level. That begins with the sporty gear itself! 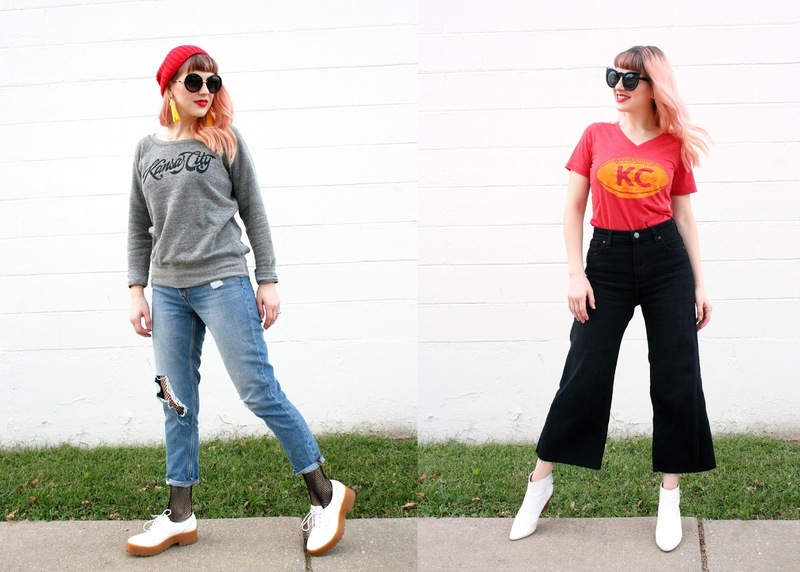 If you live in Kansas City and you haven't been to the Flying Pig Local Mercantile yet—don't walk—run to go check it out! This shop in the Crossroads has a wonderful selection of locally made items from an array of t-shirts, to hilarious tea towels, candles, underwear, and everything in between. Their t-shirts and sweatshirts are not only very well-designed, but they are soooo soft. I knew I wanted to style one of their tees, and they agreed to collaborate on this post and provide a sweatshirt for a cooler-weather option as well! 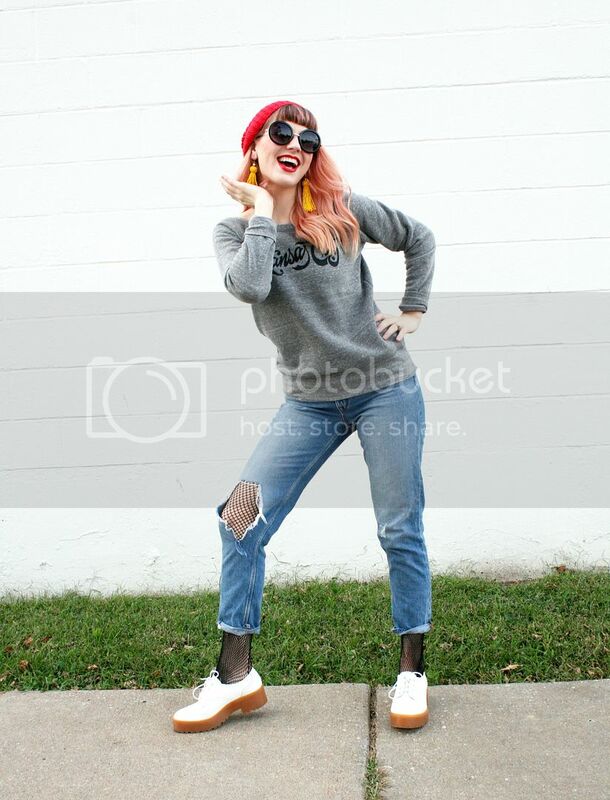 First up: cool weather styling. 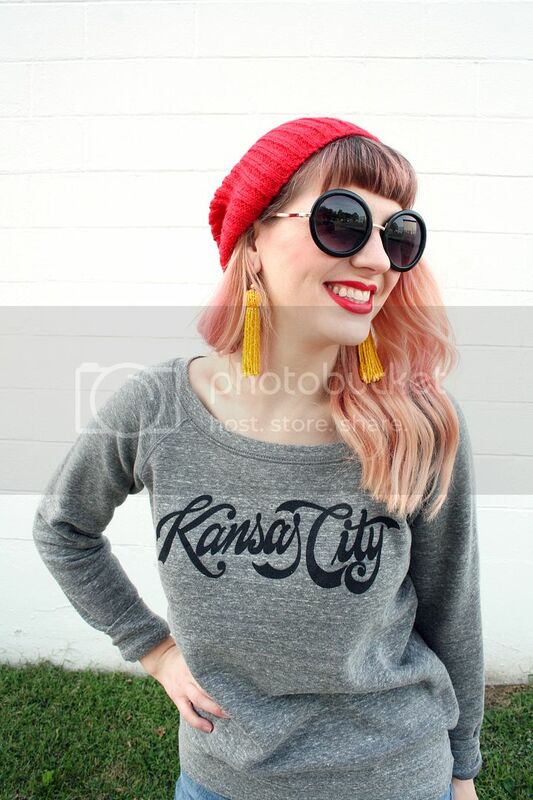 I am so in love with this Kansas City sweatshirt and I've already worn it multiple times in the couple of weeks since I've had it. It's seriously SO SOFT. I know I already mentioned that, but I just cannot emphasize that enough. I love that the gray and black make it versatile, so you could essentially style it for any type of game! That's where accessories come in. 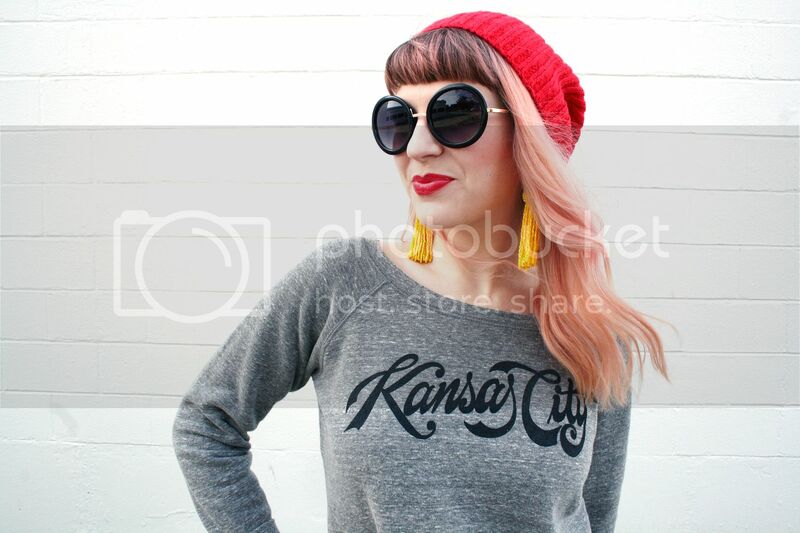 A bright red beanie and yellow tassel earrings paired with "Kansas City" make in an undeniably Chieftian (sure, that's a word now) look. A red lip helps dial up the spirit as well! 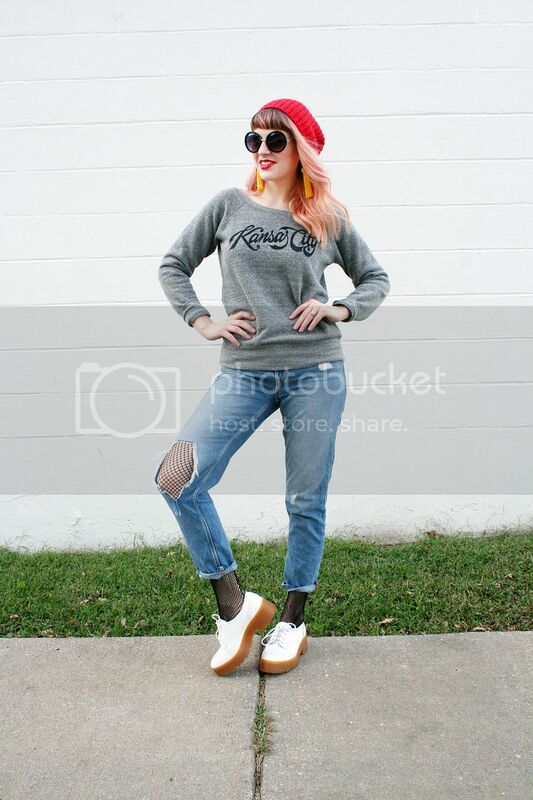 Ripped boyfriend jeans keep the look casual and comfortable, while fishnet tights and oxford platforms add a bit of edge to the ensemble. 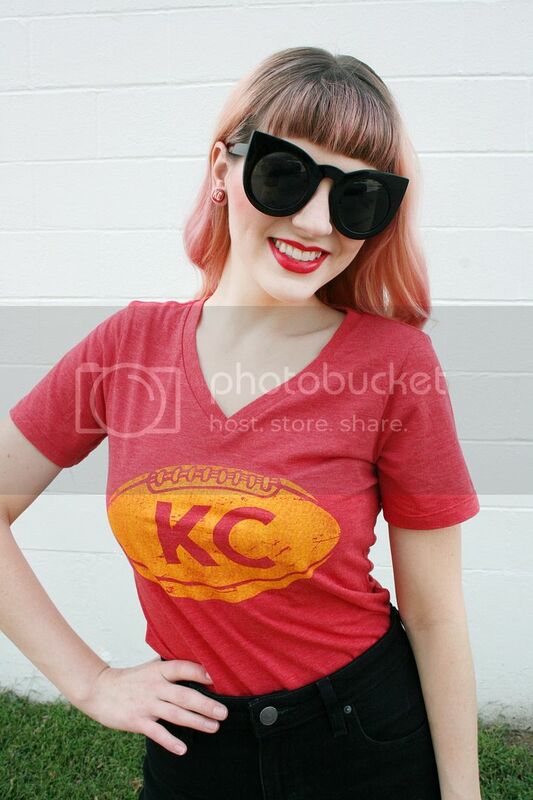 For my warmer weather look, I styled an adorable KC football tee that is, wait for it, ridiculously soft and comfortable. This would obviously work great with jeans, but I paired it with wide leg culotte jeans to elevate it for a super trendy look. White booties give the look a retro flare, but are also low enough heels that you could easily wear them all day for a day of tailgating, and walking around the stadium and your feet wouldn't get tired. Also! how cute are these earrings from Crafty Bomb? 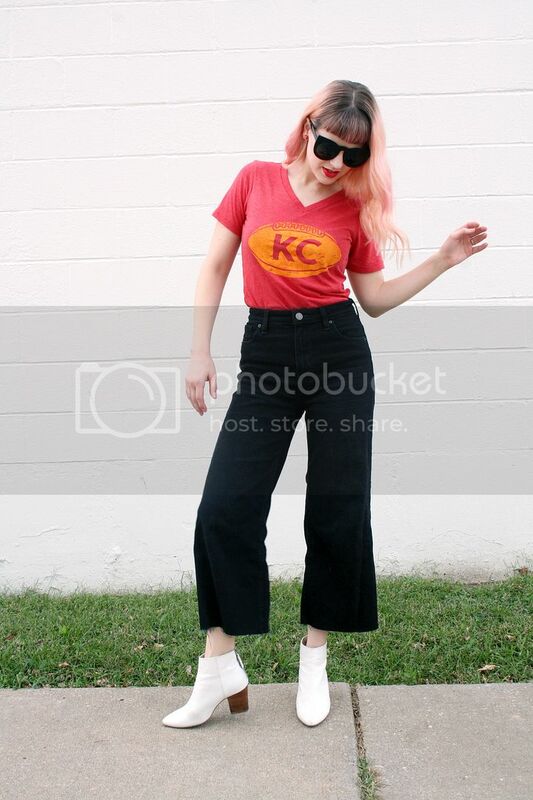 One says "KC" in vintage lettering and the other has the outline of an arrowhead on it. She has tons of mix-and-match options at The Flying Pig that you could make all sorts of combinations with. Even if the Chiefs aren't your team, I hope this gave you some game day inspiration for whatever sporting events you'll be attending or rooting for on TV. 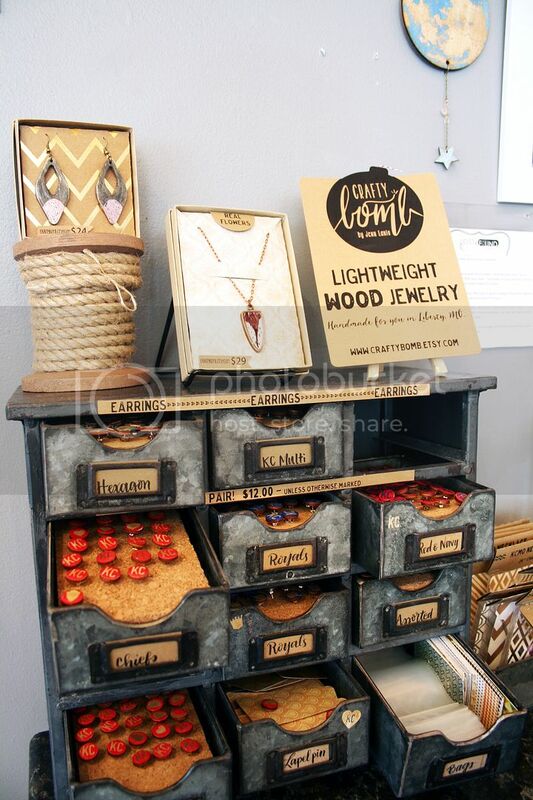 Again though, if you're in KC, you have to check out The Flying Pig Local Mercantile, not just because you're shopping local—though that's a good enough reason— but because it's filled with something for everyone!